Well THAT was odd. 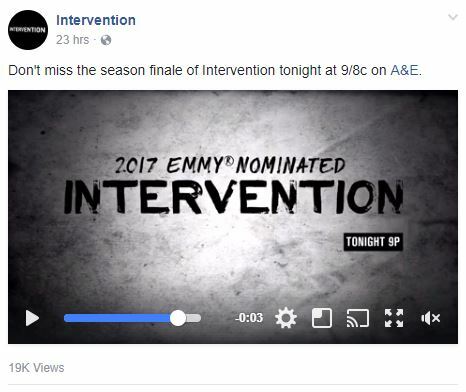 Intervention’s Facebook page announced that last night’s episodes were the season finale. The ‘all new season’ started on July 31st. That’s 6 weeks. I’m grateful to be getting episodes and all, but come on, this is nuts. Pull it together A&E! I’ll be posting on the 2 Canada eps from last night later today I hope, and then I guess that’s it for this season. Although you never know, they could come back in a month with ALL NEW EPISODES. I agree, this season was very bizarre. I find it hard to believe A&E only produced 3 U.S. episodes for the season. I suspect that the show’s ratings have been low and disappointing to A&E ever since it was brought back in 2015, and that A&E is now looking for a way to kill it. I hope I’m wrong, but I suspect that “Intervention” is finished. If there are any unaired U.S. episodes out there they will either be permanently shelved or aired only on streaming internet, for a subscription fee. I have a feeling they’re having a hard time finding people here in the U.S. to participate. Let’s get real… agree to be in a documentary about addiction? But, granted I’m not an addict, but I can’t see people really being head of over heels about wanting to have your drug use on camera. On another note.. last night’s Canada on Samantha was probably the saddest that I’ve seen to date. That Intervention….the tears, pain… all of it.. was unbelievable. They might be finding it more and more difficult to seek out subjects who don’t realize they’re being filmed for Intervention. To wit, Katherine from this season’s premiere sniffed out the show’s crew well before her own intervention was to take place (they went ahead with it anyway, but still). The Canada episodes just arent the same ???? How are they not the same ? It’s literally the same scenarios, just in a different country. The surprise element is gone for US episodes….unless the users have been without tv and internet for the last 10+ years, they’re going to know it’s Intervention from the beginning. In fact, in the last few US episodes the addicts have all seemed very unsurprised when they get to the “final interview.” It’s a shame because I really love the show, but everything has to come to an end. I like the Canadian interventionist because his eyes are so kind but they’re far too polite. My brain is always way ahead of my hands – I mean the participants are too kind, not the interventionist! I’ve noticed this too! The interventions in Canada are often less confrontational. I thought I only felt that because I am Canadian. So now I’ve got even more questions. No way! They’re all over the place! 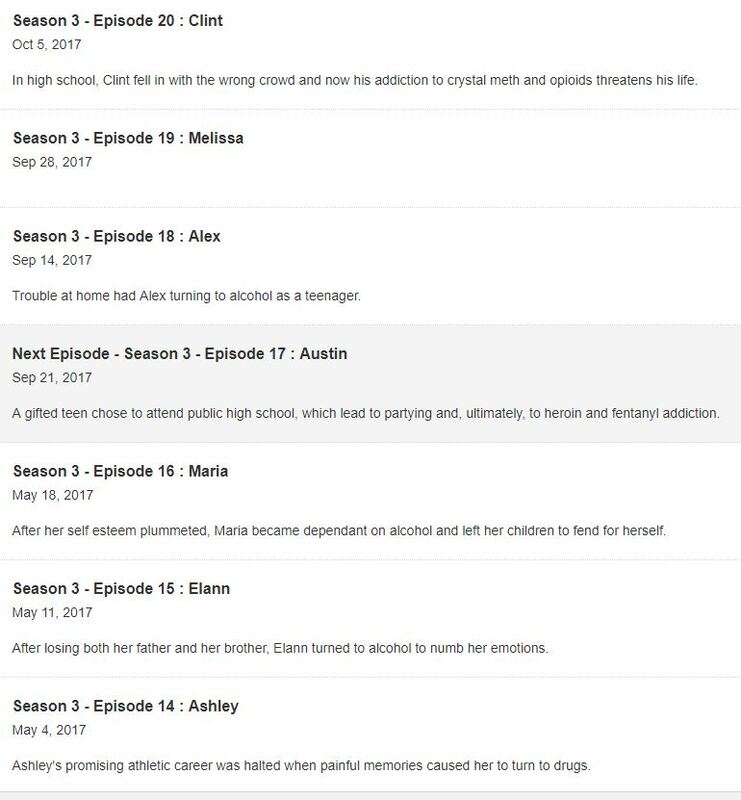 I’m betting that next week the new episodes will be Elann and Maria, which aired on Intervention Canada in May but not yet in U.S. I don’t know what’s going on at A&E. When looking at their programming, almost all of it is crass, shallow, bottom-of-the-barrel “reality” fluff. I like Intervention because there’s a real story there, and no need to add hype or false drama. I think Intervention could absolutely evolve instead of just sputtering out. For one, why not try updating the production methods and crew? Try hiring some large sensor cameras that could give the show a more modern feel (instead of the crappy old news style cameras they use). And hire a DP or get better camera operators that can add life to shots and pay more attention to available light. Why not update the thematic style as well? The tired, old head-on interview in a crappy motel staged in front of a single blue light could happily be canned. They make already depressing dialog even more depressing. It wouldn’t be hard to make give interviews a livelier look with more energy. Apart from stylistic and technical improvements, the narrative format should also be mixed up a little. The cookie cutter template they use only serves to date and dull down the show. Always knowing exactly how each show will play out gets old even for dedicated fans. There are so many clever ways to tell a story that letting Intervention– A&E’s only great show– simply rot on the vine out of laziness and ineptitude would be a shame. They tried some new stuff in Season 13 that I thought was cool. Different music, different interviewing styles, different intro. They interviewed addicts in various kinds of spaces and minimized the motel room background in general. I guess they couldn’t maintain it, motel rooms were back in full force Season 14. Check out the Jessica episode to see what I mean. This was the first one where it was obvious they were trying something new. Incidentally, Season 13 was the ‘final’ season before it was briefly cancelled. Maybe there were budget conditions to bringing it back? But yes in general I agree, they could certainly tweak production and editing a bit to liven things up. 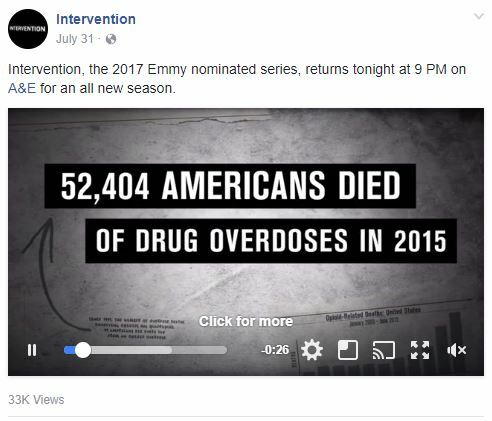 I would absolutely HATE to see Intervention leave the Air. Although I agree with many points from several of the above commenters, I believe it’s an incredibly important show. I’m a former addict and a parent of a younger child. We watch this show together and she gets to see how addiction effects people on all sides of the coin. She knows that Mommy did things like that before she met Daddy and how Mommy is a success story! But with a show like Intervention she can be exposed to the many faces of addiction without being dangerously exposed. She can see just enough to be educated. A VALUABLE EDUCATION NOT TAUGHT IN SCHOOLS,THAT GOD WILLING SHE WILL NEVER WANT TO LEARN FROM THE STREETS!!! But yes….updating it would be GREAT! I’m confused with the intervention Canada episodes. Doesn’t Canada have there own show? Or is US intervention filming in Canada now too? Idk also there were like 7 episodes this whole season. I don’t want this show to be cancelled but I sometimes wonder how much longer it will continue. Just saw a promo with Candy in it, was wondering if that means new episodes are coming soon?